by John Savage. Abingdon Press, 1996. If you are someone who too-often experiences interpersonal communication as distressing, confusing, or unsuccessful, then this resource from United Methodist pastor and communications consultant John Savage may be exactly what you need. Savage sees interpersonal communication as a complex process that is hindered by a “gap” that occurs both within and between speakers and listeners as both attempt to navigate their internal and external worlds. This slim but hearty book is a classic for ministry. 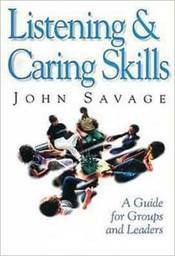 Savage offers practical suggestions, explanations, and examples to help readers enhance their listening skills, narrow the communication gap, and more easily navigate their internal and external worlds. Communication methods include how to paraphrase, how to ask productive questions, and how to offer a perception check. Other topics include body language, behavior, and tone of voice. Savage also discusses the myriad of human emotions and the role they play in communication. Ministry contexts where these skills may be helpful include inactive and potential church members, the hospitalized and traumatized, and people experiencing divorce, serious illness, or grief. The book includes an index, is written in an accessible style, and can be used for training clergy and laity alike from a variety of traditions.